The mortar and pestle are kitchen tools that have been used since ancient times. And despite being an old tool, it is still one of the most used kitchen tools in the modern day. So, in this post, we reviewed the best mortar and pestle brands available today as well as some quick guide and tips about this product. At first look, the mortar and pestle seem such a simple tool but it is very handy and can perform many tasks in the kitchen. It can be used in cracking nuts, crushing spices and herbs, and even making sauces. That’s why it’s important to choose the right mortar and pestle to maximize its use and versatility in the kitchen. The VonShef Premium Gray Granite Mortar and Pestle is made from solid natural granite, which makes it a very sturdy product that can last for many years. The mortar has a large enough size which is 6.5 inches in diameter and a pestle that is 6 inches long. Spacious enough for large quantities of food but can also accommodate small ones. Unlike traditional mortar and pestles, this has an angled design for easier grinding and pounding. However, the tilted design does make it seem like your food might slip out from the mortar. Also, since it is tilted, the entire mortar space isn’t maximized. But it does give a stylish look to this ancient kitchen tool. This is an ideal mortar and pestle for preparing a wide range of ingredients which includes soft, hard, fresh, and dry ingredients like pepper, nuts, spices, herbs, garlic, and salt. This is also useful in making different sauces, pastes, dressings, and dips. We love how simple yet stylish this mortar and pestle looks with its dark granite and tilted design. The angle surely makes it easier to see what you are doing but it makes room for food to come out from the mortar, especially dry food like peppercorns. Its round bottom also seems a bit unstable in addition to its angled design. 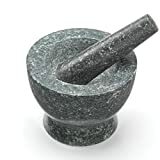 Despite having some flaws, this is a great mortar and pestle set that has excellent feedback from users because of its sturdy granite material and wonderful stylish look that suits well on the kitchen counter. The Bekith Brushed Stainless Steel Mortar and Pestle is unique because of its double stainless-steel construction that is heavy and durable. This makes it an ideal product for heavy duty use in professional or industrial kitchens to crush, grind, and mix spices and herbs. This mortar and pestle have a very functional design. It has a large non-skid base that prevents the mortar from slipping when in use which makes it a very stable. The set also includes a heavy-duty pestle press that can cover a large surface when grinding and pounding. Since the material is stainless-steel, it is easy to clean as it doesn’t retain food smells. It is also food safe and both BPA-free and lead-free. The material is very durable and can withstand daily use for many years. This is a great mortar and pestle set with a large enough surface area for grinding your food. However, we find that the stainless-steel material might be too smooth for a mortar and can make ingredients easily slip out too. But, the mortar bowl has high walls which will keep the food in. Mexi-2011M Granite Molcajete is a traditional Mexican mortar and pestle that is made of very durable and natural granite. It is great for making traditional Mexican dishes like salsa and guacamole. It also has a wonderful and stylish design that will look good when displayed on your kitchen counter. The mortar has a wide bowl with either 6-inch or 8-inch options, so you can choose what size best suits your needs. It has a three-legged base which makes it stable but tipping over can also occur unlike round bases. However, the weight of the stone makes it hold down better. The pestle called a ‘tejolote’ is short and round which makes it ideal for grinding and crushing ingredients. It can extract essential oils from herbs and spices which ancient pre-Hispanic cultures used to do. This product’s granite material is high-quality and nonporous which prevents it from absorbing the oils from food, keeping your food tasty and your mortar odorless. It also has a pebble like finish which makes grinding food even easier. Overall, this is a great mortar and pestle for crushing spices, making sauces, and grinding ingredients into paste. Since this type of mortar and pestle set has been used in pre-Hispanic culture, it has proven to be a tool worth keeping in the kitchen. The Jamie Oliver Mortar and Pestle is made of solid granite and it is an extra large mortar and pestle. It is constructed with thick walls and a base that can accommodate up to 2 cups in its 6-inch bowl. The mortars interior and the pestle are both left unpolished to allow even more friction for effectively grinding and crushing spices. The set has a heavy weight which makes it very stable when working with it. Other than that, it makes it very durable so it can resist breaking throughout its use. The pestle has one narrow end to easily hold and grip, while the other end is wider for effective grinding and pounding. The mortar has a good solid base which wide enough to prevent it from tipping over and its walls are thick enough to grip while pounding your ingredients effortlessly. Because of its material, it is very easy to clean and requires only rinsing with water and not with soap. 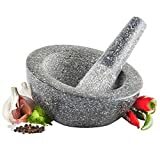 What makes this the best granite mortar and pestle is that it was designed by a chef who knows how to use this kitchen equipment effectively. The only drawback to this set is its heavy weight, which can leave some mark on your kitchen table and which makes it difficult when cleaning. 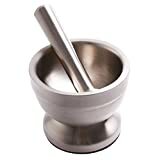 What we love about this mortar and pestle set is its polished outer surface and unpolished inner bowl that makes it ideal food processor for grinding spices, herbs, and other ingredients. The RSVP Grey Marble Mortar and Pestle is very beautiful and stylish for any kitchen. The mortar measures 2.5 inches tall with a 4.5-inch diameter bowl, while the pestle is 5.5-inch long. It is a small set so it is only ideal for making small quantity spice rubs or pastes. Although RSVP is known for its white marble mortar and pestle set, this grey marble beauty is also one of the best mortar and pestle. The unique marble design sets it apart from other products and each piece has a unique design and color. Just like Jamie Oliver’s mortar and pestle, the interior bowl of this mortar and the grinding end of the pestle is left unpolished to maximize the friction and use it for grinding, crushing, and pounding. One downside we found is its narrow round base which can cause it to tip over. However, its size is just right to easily hold and grip so you don’t have to worry much about it wobbling, plus it has a rubber pad at the bottom to keep it from slipping. Since this product is made of marble, clean-up is very effortless and simple. Just rinse it with water and use a damp cloth and wipe it clean. You don’t have to worry about stains or odors. Overall, this is a very nice high-quality product with great functionality for its small size. It was constructed very well and is very sturdy even when used every day. RSVP International RSVP Marble Mortar and Pestle, Grey ,Gray ,8-oz. We go through hundreds of products listing at Amazon and also study the ratings left by previous buyers to find the best mortar and pestle for you. Besides that, we also calculate the overall net ﻿﻿﻿﻿c﻿ustomer satisfaction (NCS) grade because we want to see how happy is the previous buyers with their purchase of the product. From our finding, we can say that VonShef, Jamie Oliver and RSVP Int. are the best mortar and pestle brands. These brands are popular and received many excellent ratings for their products. Also, the VonShef Angled Granite Mortar﻿﻿ and Pestle, JAMIE OLIVER Mortar and Pestle and RSVP Grey Marble Mortar and Pestle score favorably for the ratings as well as the NCS grade compare to the rest. We believe that you would find these mortar and pestles a good buy too. Before looking into some mortar and pestle reviews, knowing the different types first will help you make a better decision. Most mortar and pestles have very similar design and function. The only thing that makes them different from each other is their material. Below are the most common materials used to make a mortar and pestle. Come of the best mortar and pestle material are made of hard stone and it is one of the sturdiest kinds too. It is usually made from either granite, a volcanic rock, or marble, a metamorphic rock, which is sturdy enough to crush hard ingredients like peppercorns, nuts, or uncooked rice into a consistency like powder without breaking each other. What’s great about the stone material is you don’t have to put too much force when grinding ingredients. The heavier weight and hard surface will provide enough strength to crack or grind through any herbs, nuts or tough ingredients. Another common material used for making mortar and pestle is wood. However, wood is very much lighter compared to stone and this is not advisable to use for hard ingredients as it can scratch and dent the surface and ruin it. Also, maintaining a wooden mortar and pestle can be more difficult and requires more effort because mold tends to build up on the wood material. The least durable mortar and pestles are made of porcelain, ceramic or clay. Both look very nice but are too light and fragile to grind and crush hard ingredients, deeming them unadvisable for hard ingredients or especially for everyday use. The ceramic mortar and pestle are suitable for grinding or pounding soft ingredients like herbs. Since you will be using a mortar and pestle for crushing, grinding, and pounding ingredients, then it would be essential to consider the weight before purchasing. A heavy mortar and pestle will allow you to exert less effort but effectively do the job. Also, consider the surface texture of the mortar and pestle. Avoid getting something that is too rough or too smooth. A mortar that is too smooth will make your ingredients slip out easily while pounding. On the other hand, a coarse mortar can be harder to clean and unclean mortar will leave previous food smells to linger especially if previously you are working with food like chilies. The best texture for a mortar and pestle would be a pebbled or matte finish which would allow you to have just enough friction and smoothness to keep your food in without slipping out. This kind of texture is ideal for crushing and also easy to clean because it isn’t prone to retaining food smells. Look for mortar and pestle set that has a stable base and a comfortable grip. This is important because this will lessen spills from tipping over and will require less effort when working with it. An easy grip will allow you to hold on to the pestle without slipping your hands. Choosing the best size mortar and pestle set also matters and it depends on how much food you plan to crush in it. If you are planning to mix a lot of spices and herbs or make sauces, then you should go for an extra-large mortar and pestle. Otherwise, settle for a small one if you only plan to use it for just a few ingredients. Mortar and pestle come very handily in the kitchen and since it has been used for thousands of years, it has proven to be a handy tool even in today culinary world. Despite all the innovations in the kitchen today, making sauces and grinding herbs manually using the mortar and pestle still brings out the best flavors. From our list of the best mortar and pestle, what we liked most is Jamie Oliver’s polished granite because of its solid material, heavyweight, stability, unpolished interior, and perfect size. It’s a great mortar and pestle to have in the kitchen and provides versatility for your different cooking needs.